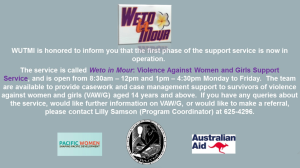 Read the findings from the community engagement study on Violence Against Women and Girls (VAW/G) and how they support the creation of a Support Service at WUTMI. The prevalence of VAW/G in the Pacific region is the highest in the world (Pacific Women Shaping Pacific Development, 2015a). The violence that women and girls experience damages their health, security, autonomy and dignity, and also limits their social, political and economic participation (Pacific Women Shaping Pacific Development, 2015a; UNFPA, 2008). VAW/G is also harmful to families and communities,and undermines development (United Nations, 2006). Pacific Women Shaping Pacific Development (Pacific Women), Australia Aid’s 10-year initiative to improve women’s economic, social and political outcomes in the Pacific region, has partnered with Women United Together Marshall Islands (WUTMI) to develop the first ever national support service for survivors of violence against women and girls in the Republic of the Marshall Islands (RMI).